In 1908, the U.S. Congress rejected a proposal to make Mother's Day an official holiday, joking that they would also have to proclaim a "Mother-in-law's Day". However, owing to the efforts of Anna Jarvis, by 1911 all U.S. states observed the holiday, with some of them officially recognizing Mother's Day as a local holiday (the first being West Virginia, Jarvis' home state, in 1910). In 1914, Woodrow Wilson signed a proclamation designating Mother's Day, held on the second Sunday in May, as a national holiday to honor mothers. Jarvis believed that companies misinterpreted and exploited the idea of Mother's Day, and that the emphasis of the holiday was on sentiment, not profit. Jarvis argued that people should appreciate and honor their mothers through handwritten letters expressing their love and gratitude, instead of buying gifts and pre-made cards. For this swap create a postcard from packaging tape. Tell about who you are honoring. If it's your mother, a woman who has felt like a mother or someone who has inspired you like a mother. Include a few sentences to tell your partners about who you are honoring. Decorate your postcard with flat goodies, favorite poems or quotes for the woman you're honoring. Get creative. To recap: Create a rectangular packaging tape postcard for mother's day with flat goodies honoring the woman in your life. Then tell a little about the woman you're honoring--because it's a postcard only put 2-3 small sentences. DO NOT coat a postcard in packaging tape, that's not the reason for this swap. 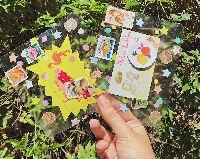 As long as you receive a postcard made of packaging tape, that has flat goodies and tells about the special woman being celebrated, rate a 5. If it's extra special, give a heart. I check profiles. No unexplained 1's and 3's. Newbies are welcome with a well filled out profile. I was once a newbie too. I will angel for anyone who gets flaked on. Contact me first. This is for US only. Feel free to host an international swap. It says we’d have 3 partners for this swap. Does that mean we will create 3 different cards? I'm new to the packaging tape PC - we actually put a stamp on the packaging tape card and mail it?